There is only one airline that flies to Bhutan and it is called Druk Air. You can entry from three entry points: Samdrup Jongkhar (southeast Bhutan), Gelephu (south Bhutan), and Phuntsholing (southwest Bhutan). Upon arrival immigration officer shall endorse your identification card: the passport or voter’s registration card. Also, please carry some passport photographs as well just in case. You will have to go personally! The endorsement is done at the entry points in Phuentsholing, Samdrup Jongkhar, and Gelephu, if you are travelling by land, and Paro airport, if you flying into Bhutan. The permit can be extended by contacting the immigration office. The following permits are issued to visitors which our local office takes care of. Tourists who plan traveling to places other than Thimphu, Phuntsholing, and Paro (free zone) will have to obtain route permit from the immigration office in Thimphu. Please remember that not all religious places are open for tourists. However, most of the religious places are made accessible to tourists but they are required to produce a special permit. Indian visitors can bring in their own vehicle but you will have to get your documents endorsed from Road Safety and Transport Authority (RSTA): www.rsta.gov.bt. The roads in Bhutan are narrow so the services of Bhutanese drivers and using Bhutanese vehicles are highly recommended. • All the immigration check posts and the offices at the port of entries are open 365 days; however the Regional Offices and the head office in Thimphu remain open only during the working days. Until the early sixties, the Kingdom of Bhutan was accessible only by foot through the high passes of Tibet and the plains of India. The construction of a road in the late sixties from Phuntsholing on the Indian border to Thimphu and Paro made travel by car and bus possible. In1983, the first international airport was opened in Paro, 65 km from the capital of Bhutan, Thimphu. There is just one airport in Bhutan. The town of Phuntsholing in south-western Bhutan is currently the only land border access open for international tourists. Phuntsholing lies approximately 170 km east of the Indian national airport Bagdogra and nearby Darjeeling. From here begins a mountain journey of almost unbelievable beauty. The road leads from the northern Indian tea plantations through endless turns, hair-pin bends and daring stretches carved into the mountain rock via Chhuka to Thimphu. The travel time for the 176 km stretch can be more than 6 hours. All major towns in the 20 districts of Bhutan are accessible by road. Despite high mountains, steep slopes, and the deepest of valleys, Bhutan has a relatively well developed network of roads. That said, rarely will one find a length of either straight or flat road. In some stretches one can encounter 6 to 7 bends per kilometre! 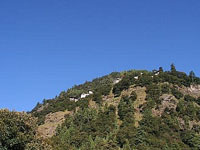 Steep ascents and descents are characteristic of road travel in Bhutan and this can make travel much slower than one may be used to. Average speeds for road travel rarely exceed 40 km/h, with tourist buses making even slower progress. One is however handsomely rewarded for the long and sometimes tiring car journey, by the spectacular views of towering mountains, lush green jungle, ancient villages and majestic monasteries. Majority of roads are sealed but can still be bumpy and are almost always single lane. 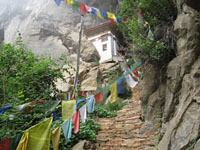 Bhutan’s drivers know their land well and are cautious and careful drivers. The density of traffic is normally very low. Tourists travel in Bhutan with medium-sized buses (20-22 seats), small buses (8-12 seats) or hired cars. Road widths do not permit larger buses.